The warmth of the welcome belies the frost outside. Regardless of the weather, you will always find a warm welcome at Leloma with private access to your room from the secluded garden, Leloma is a place where you will always feel special. Leloma is close to the Hospital and main business centre, making it ideal for those who come to Orange on business. Being only 8 minutes walk away from shops, clubs and restaurants also makes Leloma perfect for those who wish to explore Orange and surrounds. 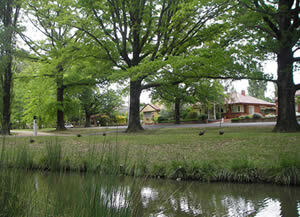 While Leloma is located on a quiet street, there is easy access to main roads. 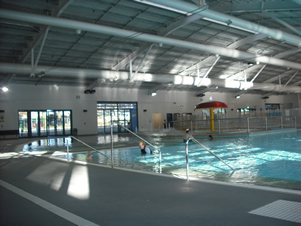 The Aquatic Centre now has an undercover heated pool area consisting of a 25 metre lap pool plus a separate leisure pool. The outdoor 50 metre pool and diving pool have been retained for use in summer. The Centre is open daily from 7am - 7pm. So you can enjoy a swim year-round at the Aquatic Centre opposite Leloma, or take a relaxing stroll through the 4 hectares of parklands and wetlands. 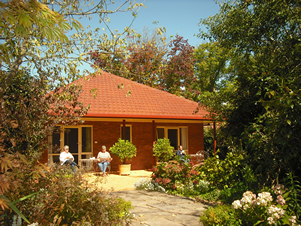 Make Leloma your home while exploring the many historic villages close to Orange on the Central Tablelands or venture further on day trips to the Central West towns. Or just enjoy the serenity of Leloma while the fast wireless broadband connects you back to the office, or anywhere in the world.